Before I knew it, our road trip was upon us. Easter was almost here and that meant it was time to pack some warm clothes, waterproofs and get ready for a 10 trip to Ireland. The plan? 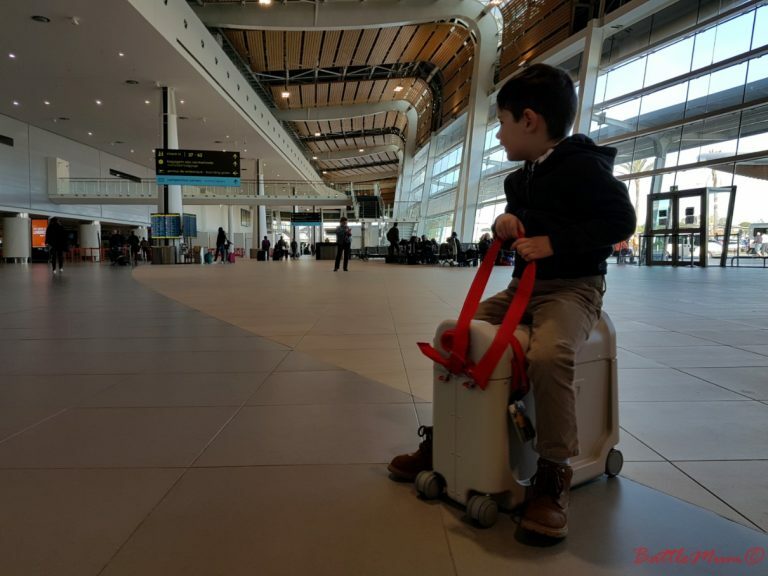 7 days touring the southern half of the country in search of dragons, animals and other delights, before heading to the capital to catch up with family and act as tourists in our home town. 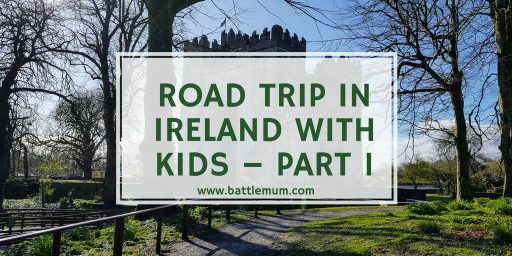 So here is our road trip in Ireland with kids Part 1. It started with an early morning rise to get ourselves to Faro airport, ready for our Aer Lingus flight to Dublin. BattleDad, who was staying behind because of work, drove myself and BattleKid to the airport for our 11.30am flight back to Ireland. Our flight was fairly uneventful, apart from a bit of turbulence, and by 2.30pm we had landed to rain. Typical. We had seen plenty of it in recent weeks in Portugal and I hadn’t expected anything different. Once our bag had arrived on the carousel, BattleKid and I headed to the Hertz desk to pick up our rental car for the ten days. Normally we have family collect us and ferry us around, but as we weren’t staying in Dublin, a car was necessary. The gentleman on the desk kindly called the office located a short distance from the airport to request our car be brought to us. Normally, you get a bus to the depot but as he saw I was travelling alone with BattleKid, he kindly arranged for them to bring the car to me. A few minutes later a smart Skoda Octavia was delivered and BattleKid and I were soon on our way across the M50 to pick up some shopping and wellies from my sister before joining the M7 to head to our first port of call on our road trip, an AirBnB in Limerick. It took us two hours from Tallaght to the area just inside the Limerick border from Tipperary and we were soon greeted by our host who showed me around the house we’d be staying in for the next four nights. Wow. That was my reaction to what is easily the most beautiful and comfortable AirBnB I’ve ever stayed in, and I’ve stayed in quite a few. It was a very modern house, with everything you’d need in it for a family to enjoy their stay in Limerick and the surrounding areas. BattleKid and I unpacked, and I got dinner on while he caught a few cartoons on the TV in the living room. Unfortunately for me they ended before dinner was ready and Battlekid, not used to ‘real’ TV, came in complaining he wanted Scooby Doo back on. After dinner, BattleKid enjoyed a bath, a luxury these days as we don’t have a bath in our home, just a shower. And before I knew it, it was time for bed before our first day of exploring. Both he and I were knackered after a full day of driving so we slept like logs. The next morning, we woke just after 7 and after breakfast, I packed a light lunch into the car along with our waterproofs and wellies and we set of on our first day of exploring castles and dragon hunting. First up was the Rock of Cashel. 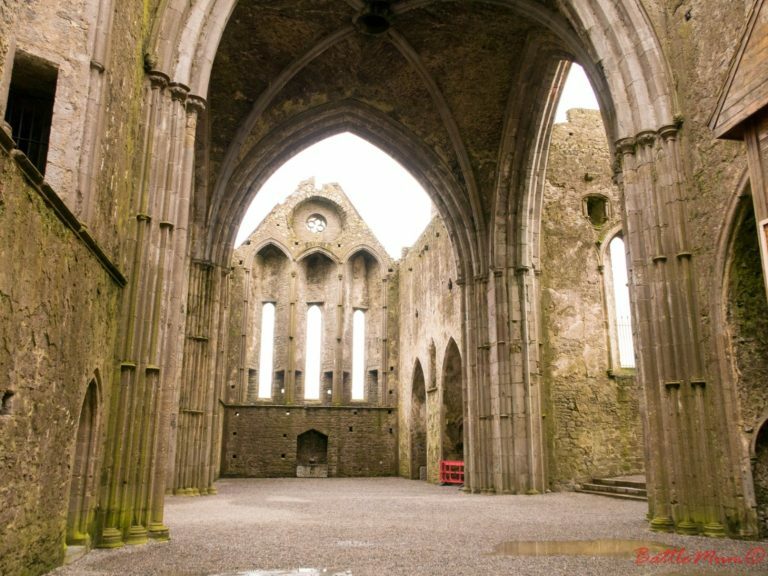 I had originally planned our day in reverse to the order we did it in, planning to end at the Rock of Cashel which was only 30 minutes from our AirBnB. However, after learning it can get very busy and the fact that Lismore Castle and Gardens don’t open until 10.30am, we started at the Rock of Cashel. Technically, the Rock of Cashel isn’t a castle. It is an Abbey dating back to the 12th century. That said, when you’re four years old, an old Abbey like this looks like a castle, so BattleKid was on for a dragon hunt. We had caught a glimpse of the Rock of Cashel as we passed through the town the day before enroute to our AirBnB and it is an amazing sight to see, even from the road. I was just raging I was on my own as there is nowhere to stop to photograph the Rock from the road. So, you’ll just have to take my word for it. 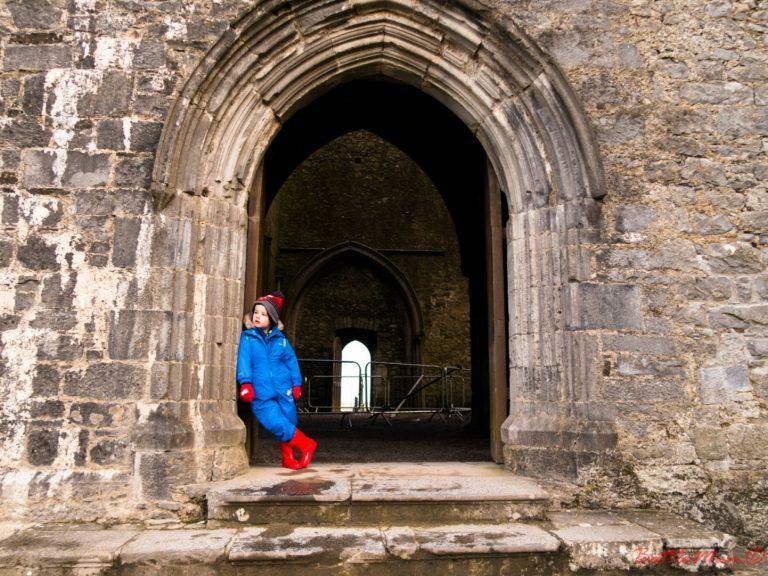 We parked in the carpark adjacent to the Rock of Cashel and walked up the hill to the entrance, where I paid for my entry (BattleKid was free as he’s under 5) and guide book, and we set off in search of a dragon. The Rock of Cashel is a very impressive sight but isn’t too big and so we didn’t spend more than an hour there, exploring inside the abbey before taking a short walk through the graveyard. 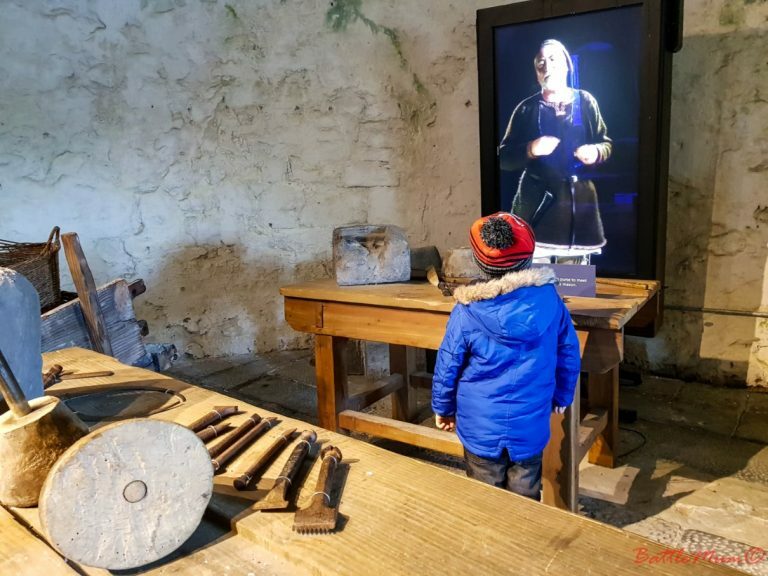 Having found the Rock of Cashel dragon hiding behind a great big pillar, we returned to the car park, paid up and headed to our next destination which was Cahir Castle, about a 20-minute drive from Cashel. BattleKid had moaned when I said we were heading to another castle, but once we arrived the moaning stopped, and he was keen to go inside. Cahir Castle is located on the banks of the River Suir within the town of Cahir, County Tipperary. I hadn’t thought of visiting it until my mum mentioned it and once I’d seen a few pictures online, I knew I had to put it on our must-visit list. Again, BattleKid was free entry as he is under 5 and once we entered the castle, the fun began. It started in the main courtyard with BattleKid shooting me with the canons. I pretended to be dead each time he shot me, and he found this hilarious. Then it was time to start hunting for the dragon. We explored many of the different rooms and towers of the castle during our visit and also enjoyed a short walk around the gardens which were starting to show signs of Spring. I have to admit I enjoyed this castle quite a lot and could have spent more time there had a little person allowed it. We found the dragon and after a visit to the toilets, we returned to the car to head for our final destination of the day, Lismore Castle in County Waterford. If we weren’t visiting that castle I would have taken time to swing by the Swiss Cottage which is not far from Cahir Castle. Lismore Castle was located 40 minutes south of Cahir Castle. We drove through some amazing scenery in the mountains on our way there and it reminded me of both our honeymoon trip through the Gap of Dunloe and parts of the A470 in north Wales. 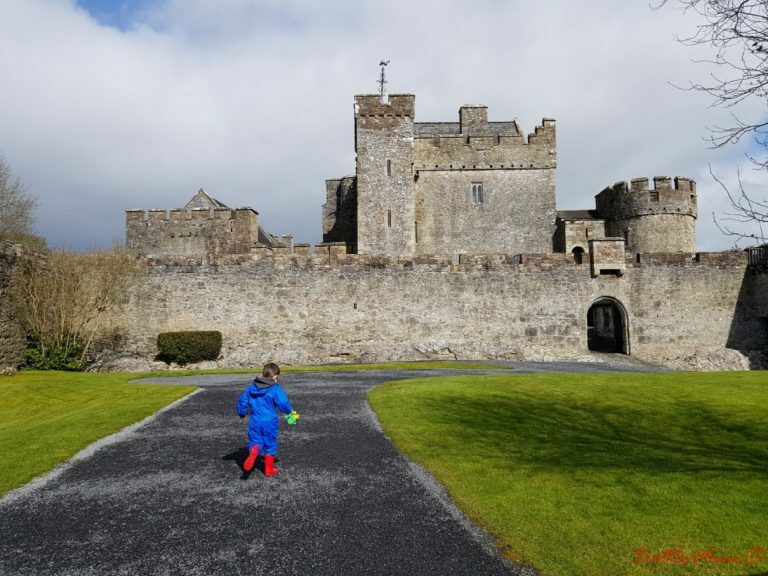 We arrived at Lismore Castle around midday and as we’d had some of our sandwiches in the car before we left Cahir Castle, we weren’t too hungry so paid our entry fee, and using the map we got in the ticket office, we started exploring the grounds. Although not fully in bloom, the gardens look amazing and you could see signs of Spring trying to creep in. After exploring some of the lower gardens we found the play area which housed a pipe tunnel down which BattleKid just had to slide. I was so thankful I’d dressed him in his waterproof all-in-one so that I could say yes to his “please mammy” when he asked if he could go down the slide. I would have had a very disappointed child on my hands if I had refused. Well, he thoroughly enjoyed himself, going down the slide several times before we decided to go and warm up in the café with tea and cake. The castle itself is under private ownership and so isn’t open to the public but there is a small café and exhibition at the side of the house. I ordered a cake, some tea and a drink for BattleKid, and found a seat in the small dining area. There was a reading room off the side of this and BattleKid wanted to explore so I took his wellies and waterproof suit off and let him enjoy himself. There was another lady in the café with her little boy and while the boys were in the reading room we got talking. Like me, she was an older mum and we had a lovely time chatting while keeping an eye on the boys. BattleKid and I hadn’t walked around the upper gardens, so she offered to go with us as the boys seemed to be enjoying each other’s company. We had a lovely time chatting while walking through the upper gardens, before bringing the boys back to the lower gardens to play in the play area. 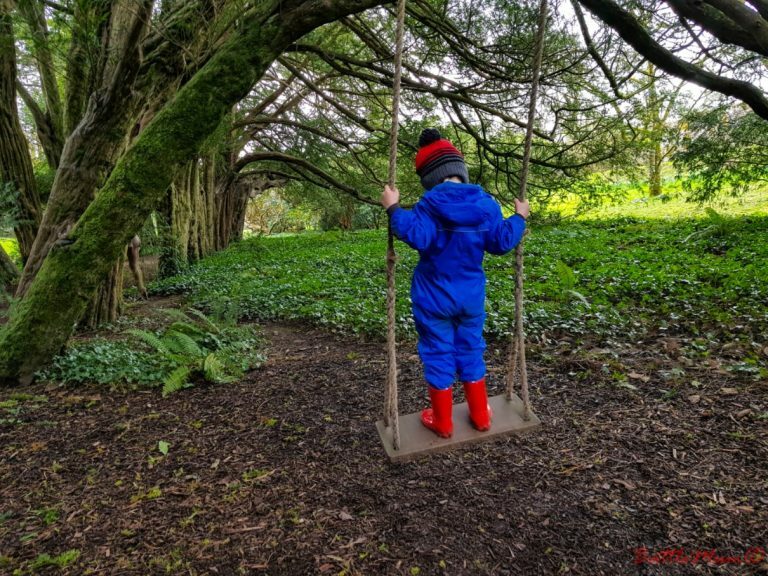 Sally and her son have annual passes to Lismore Castle and so they showed us a great swing which BattleKid had a go of, before we returned to the area with the slide. Sally’s son wasn’t in waterproofs, so he couldn’t go down the slide. 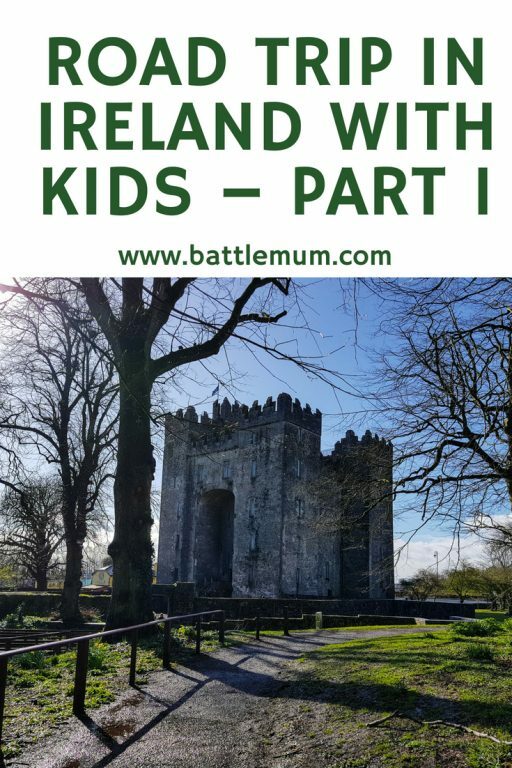 As us mums were too busy talking and the boys too busy playing together, we didn’t have time to do a dragon hunt in the gardens of Lismore Castle. In truth, we forgot all about it. It was soon getting time for BattleKid and I to make a start back to our AirBnB, but before leaving Sally and her son, we visited the playground beside the car park for about 10 minutes before saying our goodbyes. Sally and I exchanged numbers in the hope we would be able to reconnect a few days later when I moved on to Cork. We then set off for Limerick County, an hour and twenty-minute drive back. I briefly stopped at a Tesco in Cahir to stock up and get something for dinner and we arrived back before 6pm. We’d had such a lovely day and had an unexpected afternoon with Sally and her son. Needless-to-say we were both wrecked that evening and were early to bed. BattleKid and I woke not long after 7am again and took this morning a little slower, enjoying breakfast together, before I put together a packed lunch for us. After getting dressed and packing up the car, we set off for our next set of adventures starting with a dragon hunt in Bunratty Castle. BattleDad and I visited Bunratty Castle during our biking honeymoon in Ireland courtesy of my sister-in-law who surprised us with an overnight stay in the honeymoon suite. She had also booked us into the Medieval Banquet which is held in the castle each evening. We were also given the privilege of acting as the Lord and Lady of the Manor during the banquet. So, I knew I had to return with BattleKid. We arrived at Bunratty Castle and Folk Park shortly after 9.30am, paid our entry and in we went. However, I had to quickly put on my waterproof trousers as the heavens opened just as we left the ticket office. Thankfully, BattleKid was already in his waterproof suit. 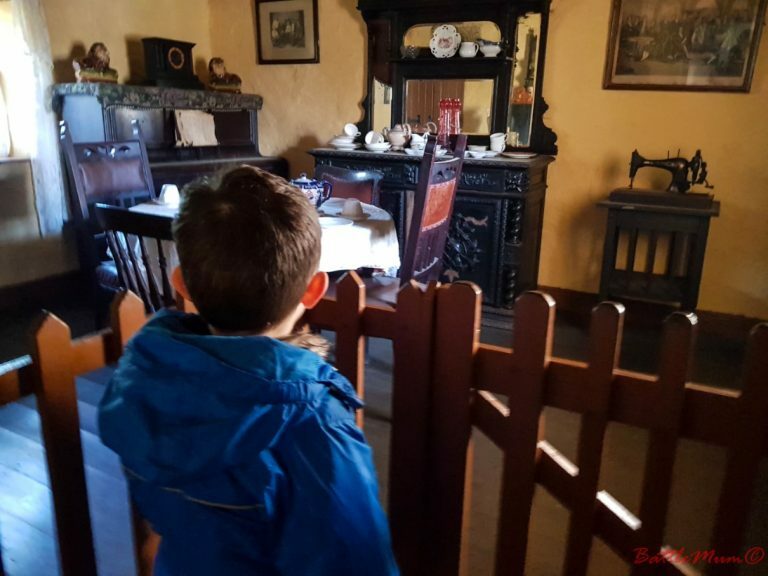 When BattleDad and I had visited Bunratty Castle we never had time to explore the castle or fold park, so this was a new experience even for me. We started out by turning right from the ticket office and headed towards an area that housed some farm animals. We saw chickens and pigs before doubling back and heading towards the castle. Bunratty Folk Park reminds me of St Fagans in Wales. There are houses you can enter which are set as they would have been decades ago, complete with old, traditional furniture and peat fires. Oh my, the smell of the fires transported me back to my youth and time spent in my parents second house in Galway. BattleKid was fascinated by the houses and kept asking where the stairs were, as many only had ladders to access the bedroom upstairs. We visited the gift shop within the grounds and bought a few souvenirs before making our way to the castle itself. We explored two large rooms, one of which is the room in which the medieval banquets are held. We also managed to find the Bunratty Castle dragon, hiding on a window ledge along a corridor. BattleKid was thrilled. Satisfied we’d seen lots that Bunratty Castle and Folk Park has to offer, we made our way to the main gift shop where we made a few purchases. At this stage it was lunchtime, so we stopped at the café and had a bite to eat before setting off towards Limerick City, our next destination. Next up was King John’s Castle in Limerick. I had hoped to visit Adare Castle too but found it doesn’t open until June. King John’s Castle in Limerick was quite a surprise to me. This 13th century castle is located on the banks of the River Shannon and is quite large. After paying my entry, again BattleKid was free, we entered an exhibition about the castle which included a model of the castle. There were buttons to light up certain parts of the model and BattleKid had to be dragged away from this, as you can imagine. I would have liked to have enjoyed the exhibition a bit more but a certain 4-year old had other ideas. We passed through an excavation exhibition and came out into the main courtyard of King John’s Castle. It was huge. There were some outdoor stables and areas to explore but BattleKid was eager to head into some of the towers. The first one we entered had a display about the stonemason of the castle. On the table in this room there was a small coin pouch, which if you lifted it, started the stonemason on the screen talking. BattleKid got a bit of a fright when he started talking. I found it quite amusing. The stonemason who made BattleKid leap! After this tower we crossed the courtyard to the Twin Towered Gatehouse and we climbed the spiral stairs to the upper levels. There were some amazing views across the Shannon, but it was rather chilly up there, so we didn’t spend too long up there. However, we did find the dragon we were there to hunt in one of the rooms in the towers, much to a little boy’s delight. 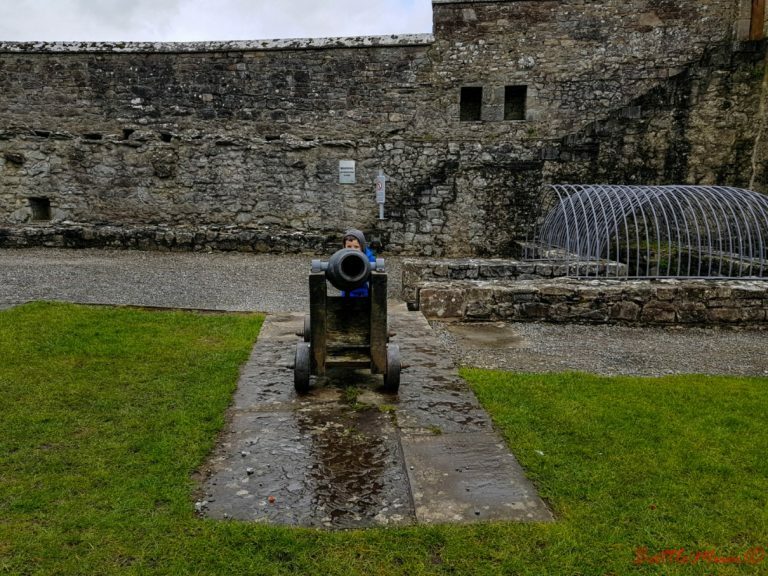 We thoroughly enjoyed our visit to King Jonh’s Castle and before we left, BattleKid enjoyed some shooting of mum with the cannons outside again! It was mid-afternoon by now, but I had promised BattleKid a new book. As we didn’t find one in the gift shop at either castle, I found a shopping centre just a ten-minute drive from the castle which had an Eason’s bookshop in it. We headed there and I bought BattleKid two new books, as well as a small toy. I also got the chance to pop into the Gap Outlet store they had there and I stocked up on some hoodies for BattleKid as his last Gap tops were now too small for him. After finishing up at the shopping centre, we headed back to our AirBnB and arrived just 35 minutes later around 5pm. We’d had a lovely day and visited two amazing castles, finding a dragon in each. After dinner and a bath we were early to bed, pooped after a great day out. My sister-in-law lives in Athy and I really wanted to visit her during our road trip so that BattleKid could spend some time with his cousins and also so we could meet the latest addition to the family. We set off from our AirBnB just after 9am and headed for Dunnes Stores in Carlow to grab lunch supplies. It was quite cold this morning and the car was telling me so with outside temperature warnings. We headed over some mountain roads and there was evidence of snow on the sides of the roads. I took my time, arriving at the shops before 10.30am, with a snoozing BattleKid in the back! We picked up lunch supplies and Easter eggs for BattleKid’s cousins and arrived at my sister-in-law’s a short while later. We had such a lovely afternoon there and BattleKid had a whale of a time playing with his cousins. And of course, I got a cuddle of my two-week old nephew. It was so nice catching up with them. We left just after 4pm to get back to our AirBnB and it was still cold. We were able to take a more direct route back, but our return journey was not without a little bit of drama. We were on the M8, about 30km from Cashel when I could see brake lights ahead, blue flashing lights and hazard lights as well in the distance. I slowed right down and as I drew closer to all the lights we hit slushy snow. Nowhere else on the motorway had there been any sign of snow. Two cars had crashed on our side of the road, both on the verge with police in attendance, and two on the opposite side of the road. I can only imagine that a micro-climate on that particular stretch of road had made the perfect temperature for the rain which had been falling to turn to snow. I don’t think the drivers were expecting it and had been caught out by it. Their misfortune was a warning to us and others to be careful with the rain and cold temperatures we were experiencing. I took my time from there and we got back to our AirBnB an hour later. I text BattleDad to let him know we were back safe and sound. After dinner and a bath, I got us mostly packed, ready for the next day when we would leave the amazing AirBnB and head to Cork to spend Easter weekend with my sister and niece who were joining us for two days. So far, our road trip in Ireland over Easter was working out brilliantly and I was so glad I had organised it. We had visited some amazing castles and caught up with some family and it was going to continue. 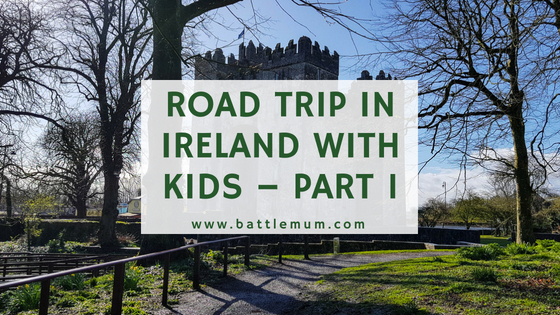 If you’d like to know how I planned our road trip in Ireland, you can read my post about it on the blog. It sounds like you had a lovely holiday! I love castles and I’d love to take the twins to Ireland one day. I don’t think I’d be brave enough to do it solo though! Thanks for post as I’m keen to go to Ireland soon! How cool are those suitcase?! Ireland is on our bucket list. It looks so beautiful. You always amaze me with your travel adventures! Sounds like you had a full on holiday! I have family in Ireland and would love to one day visit but I wouldn’t go on my own with Mr B. You were very brave to holiday solo! I’m in awe of some of the places you visited. Last year in May myself and a friend visited Killarney in Kerry and it was just simply stunning. Well done you on such a well organised trip! The road trip sounds like good fun. Visited Ireland 2 years ago but didn’t have the time to explore properly. Sounds like a packed trip, but detail like having the car bright to you and lovely accommodation make all the difference. Sounds like a really good road trip, I want to do a road trip and AirBnB is perfect for that isn’t it. Thanks for the idea!